« Graham Cracker Houses and Cookies! is celebrated on December 6! In most of Central Europe St. Nikolaus Eve, Dec. 5th, is a day most children fear and at the same time look forward to, because if they were good, they anxiously anticipate St. Nikolaus who comes with arms full of gifts which brings a happy smile on every child’s face. At the same time they fear Krampus, St. Nikolaus’ constant companion, because if they were naughty they would get a trashing with a birch switch from Krampus’ basket. The customs vary from country to country, but St. Nikolaus is always the central figure representing kindness, generosity and love. His companion comes in different versions and has different names, like Knecht Ruprecht in parts of Germany, Krampus in Austria and Croatia, but he is always there to frighten children who behave badly. When I was little, and still lived in Croatia and later in Austria, I remember that many days before this holiday I was learning a poem or a new prayer in preparation of St. Nikolaus’ visit. St. Nikolaus was usually a member of the family or a friend who wore a costume of a Bishop. He was dressed in a long white robe with a red embroidered cape, and a Bishops miter, had long white hair and beard, and always walked with a staff, the staff being a long rod for the old gentleman’s support and certainly his sign of authority. Krampus being a furry creature with two horns sticking out of his head, a long red tongue and a long tail, he looked more like the devil impersonated and therefore very frightening. Next to the chains which he carried, he usually had a big basket or a huge bag on his back where he would put the naughty children and carry them to the underworld. On St. Nikolaus Eve, Dec 5th we dressed for dinner and in the middle of the meal, we heard heavy footsteps approaching the front door and the clanking of chains while the whispering voice of St. Nikolaus was giving orders to his companion. My father opened the door and St. Nikolaus came into the house while ordering Krampus to stay outside in the hall and wait until he is called. This stately gentleman came into the dining room and noded to everyone with dignity, and with extreme reverence everyone would acknowledge his presence by bowing to him. Then he would ask me if I was a good girl during the year…….and of course I would nod my head, and when he asked me to recite a poem, I was so frightened that I would not get a word out until mother said the first words. St. Nikolaus would say a few kind words to me while Krampus rattled his chains in distress and impatience. If a child’s performance was not done well and was naughty St. Nikolaus would call Krampus to come into the dining room and Krampus would pretend to put the child into his bag or basket. 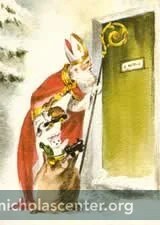 St Nikolaus would calm Krampus down and ask for some birch switches which the old gentleman would give to the naughty child to remind him that if he does not listen to his mother and father during the year he would have to go with Krampus to his dark home in the underworld, when they come back next year. I was so relieved when they finally left, that I did not complain about cleaning and polishing my shoes, which was a nightly chore. The clean shoes were placed into the space between the double windows in the living room, in good faith, that St. Nikolaus will be back during the night and fill my shoes and window sill with sweets for my delight next morning. In all the Central European households, St. Nikolaus Day, Dec. 6th, was the start of all the holiday preparations. In my grandparents’ home the baking started with the cookies, since they could be stored in grandmother’s pantry for the next few weeks without spoiling. The hand-made gifts were crafted every evening. by the fire and around the big round table in the living room. The Advent wreath was made and the four candles were put into place for the first Sunday of Advent, which falls usually on the Sunday after St.Nikolaus Day. There was a whispering in the air, and a holiday feeling which was so special and never occurred at any other time of the year. It was the time of Advent…….the anticipation of Christ’s birth. Here in Baltimore, when my son was five years old I wanted to continue with an adaptation of this St. Nikolaus tradition. Since he had so many toys, and out grew many of them each year, I asked him to collect the ones he wanted to give away to St. Nikolaus so they could be given to children who did not have as much as he. On Dec.5th, in the evening, we put the toys which were still in perfect condition, into a white plastic bag and tied it with a big red ribbon. We placed the bag and his boots next to the stairs in the foyer before he climbed the stairs to go to bed. Next morning the bag was gone and in its place he found several Christmas books and some European chocolates. I read these books to him every evening before going to bed until Christmas Eve. Once again a lovely memory. I also remember fondly December 5th as it was my Mother’s birthday. I just love your story Maria. You made it so very personal-a nice gift from you for Dec. 5th. Need to remember to put my shoes by the door. Michael………it is long ago, because it was another world that I/we lived in. When I write about my childhood it feels as if I am writing fairy tales……….Thank you for your nice comment! We celebrate St. Nikolaus day! Our kids put one of their shoes outside of their bedroom door and in the morning it is filled with a Christmas ornament to hang on the tree and also sweet treats! So glad you posted this, Maria. We also celebrate St Nicholas! And my “kids” are all married! They still love it!!! I love traditions! Maria, love your story and your ability to make us feel a part of it! Nadine………..thank you for your nice note and kind words! Hope all is well? My best to all the family! We’ll be shining our shoes! My husband is from Hungary and has kept the tradition alive in our American family. Valerie…………so good to hear from you! I know your children will have a great time tonight and tomorrow morning! I am looking forward to meeting you and your son at decorating a gingerbread house in Maja’s Kitchen soon. for gift presentations 18 days later! Anthony……..that is certainly a different idea, St. Nikolaus being a “scout” – but great fun for your children! I love your sense of humor! Thanks for reminding me of a very fond memory! Every year we lived in Germany, my landlady would leave a Becker of goodies on the front stoop for my son. Maria, I do so enjoy hearing about your traditions of long ago in Europe. Thank you so much for sharing them. Thanks for bringing back such wonderful memories, Maria. Every year, my brother and I would leave our shoes out overnight, hoping St. Nikolaus would fill them with treats. We were never disappointed. For years, my two sons left out their shoes. But they have not continued the tradition with their own children. Thank you for sharing your wonderful post. Thank you for your nice comment – Sue! I am happy that it brought back memories……..
My son too has not continued with the tradition with his children….sadly! Your story was beautiful, as usual. You are blessed with a gift of storytelling. I felt I was there. Jasjym, our granddaughter in Holland, celebrated St. Nicholas Day with a few inches of snow. Thank you Maria for all that you offer us with your stories, advice and wonderful food thank you.